A SHOW TONIGHT IN NYC? They Might Be Giants will be performing 3 songs tonight - Friday, December 15 - now at The Canal Room (please note the change of venue!) at the Harry Shearer & Judith Owen Holiday Sing-A-Long to benefit Tipitina's Foundation, New Orleans. The Giants will be joined by luminaries Bob Balaban, Paul Shaffer, Julia Fordham, Marshall Crenshaw, Jill Sobule for a festive and entertaining evening. Both shows on Saturday are fully and utterly SOLD OUT! 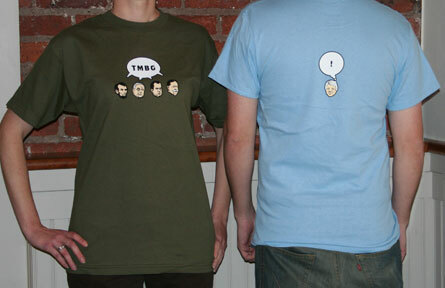 TMBG's holiday gift - not on the new album and only available here - until the next podcast! Find it at tmbg.com/freeTunes.html [login: tmbg / password: thespinesurfs]. VOTE NOW - "BEST ACT OF '06" ON UGO! It's easy - simply select the radio button next to They Might Be Giants and click "Vote for the band". Voting ends on 12/28 and the winner will be announced on 12/29. All orders requesting FedEx delivery will arrive at your home in a reliable, trackable manner. Place your FedEx orders as late as 2 pm on Thursday, December 21 to ensure delivery by Christmas. Bundles make shopping for anyone oh-so-easy! New Stuff Bundle- Featuring our newest stylishest items! Choice of Anteater shirt or girlie No! shirt + IO hat: $35. You save $10! Add Venue Songs for $15 more! Good Cheer Bundle- Who doesn't like a little good cheer at the holidays? Spread it around to your friends and neighbors. Like a cold, but better! 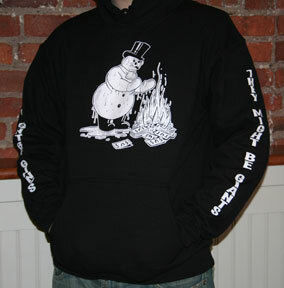 Venue Songs DVD, Holidayland CD, Snowman sweatshirt, choice of t-shirt: $65. You save $20! Myspace Bundle- Our best bundle value. Keep some stuff for yourself, give the rest to your chums. Venue Songs DVD, Holidayland CD, choice of Spine or User's Guide CD, Snowman sweatshirt, choice of t-shirt, choice of Gigantic or Direct From Brooklyn DVD: $100. You save $29! ABC DVD, Bed book, choice of No! or ABC CD, choice of kid t-shirt: $50. You save $10! Baby Elf Bundle- ... or an extra-little elf who needs some fun stuff. ABC DVD, Bed book, choice of No! or ABC CD, choice of No! romper or Puppet onesie:$50. You save $10! 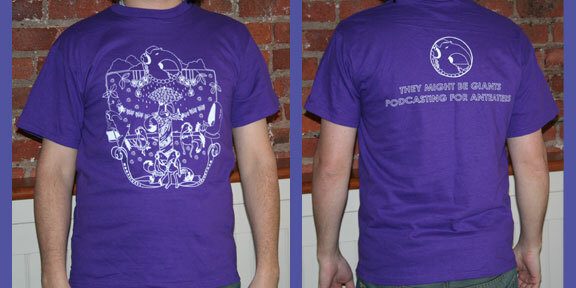 A new, very popular design among podcasters and anteater fans alike. If you fall into either of those categories or if you just want the satisfaction of supporting TMBG's ongoing podcast adventure, then this is the shirt for you. Now in more sizes! Designed by Jessica Rotter. Featuring more presidents than you can shake a stick at, this Chopping Block- designed t-shirt comes in light blue and olive. Doesn't this sweatshirt look great on our friend Sneaky Pete? The TMBG snowman never goes out of season. plus , , ... and so much more! sign up if you are part of this lifestyle choice! explore the new site, and find the secret clues! artist-owned, robot-controlled; buy MP3s direct from the band - it's so darn easy! want to get the free podcasts but don't have an iPod? Find out why you don't need one, how to subscribe for free, and more!